The goal of all drivers should be to keep themselves, their passengers, and those around them as safe as possible when they venture out on the roads. Fortunately, reliable sources, such as state issued driver’s manuals and online driver safety courses offer sound information and advice for safe driving. Still, for nearly as long as cars have been around, misconceptions and just plain bad advice about safe driving continues to circulate. As the era of self-driving cars rapidly approaches, hopefully someday in the not too distant future, all concerns about behind the wheel safety will become a thing of the past. In the meantime, a good approach to help keep you and others out on the highways safer is to get rid of bad and potentially dangerous driving advice once and for all. To that end here are 5 safe driving myths debunked. Studies show that people generally tend to believe that they are smarter and better looking than others probably perceive them. And it’s also human nature to think that you are a better—and therefore safer—driver than you really are. In fact, numerous surveys show that roughly 70-90 percent of drivers believe that their driving skills and abilities are above average. Unfortunately, statistics paint a different picture, in that 90 percent of all automobile accidents are attributed to some degree of driver error. After all, driving a vehicle that weighs thousands of pounds at various speeds and all types of road conditions is a complex task. Assuming that you are not the best and safest driver on the road, being extra cautious and practicing defensive driving is the smart way to go. You lock your car doors when you park your car to keep people from breaking in. So it makes sense that you’d want to leave your doors unlocked while driving so rescuers can break you out of your car quickly should an accident occur, right? Wrong. In fact, that myth is dead wrong. Statistics show that 10,000 people die each year due to injuries sustained from being ejected from their vehicles during a crash. Tragically, unlocked doors are far more likely to open during a collision, which increases the likelihood of being ejected from the car. Fortunately, the doors in many newer vehicles are designed to automatically lock while driving and unlock when airbags deploy. But a good rule of thumb for any driver in any vehicle is to make sure that all doors remain locked while driving. In the event of an accident today’s rescuers are equipped with the tools they need to extricate drivers and passengers quickly from wrecked vehicles. Driving while carrying on a conversation–whether that conversation is on a hand held cellphone or via a blue-tooth enabled headset–is just plain dangerous and should be outlawed in all states. According to The National Highway Traffic Safety Administration (NHTSA), one-fourth of all car accidents reported to the police are the result of driver distraction, and cellphone distraction is near the top of the list. Although headsets free up both hands to grab the wheel, talking to others–even other passengers in your car–is a distraction that you need to avoid. To be extra safe you should encourage your passengers to keep cellphone use to a minimum while you are driving. It seems preposterous that this myth even exists. And yet statistics prove otherwise. How else can you explain statistics that show that 80 percent of people in the front seat wear seat belts, compared to fewer than fifty percent of rear seat passengers. While sitting in the backseat may create a false sense of greater safety during a crash, unbelted passengers usually don’t have airbag protection. In addition, all objects in the car—including people–that are not secured in some fashion become dangerous projectiles that increase the likelihood of injury for everyone. For the safety of you and your passengers, always insist that everyone in the car is buckled up before turning on the ignition. 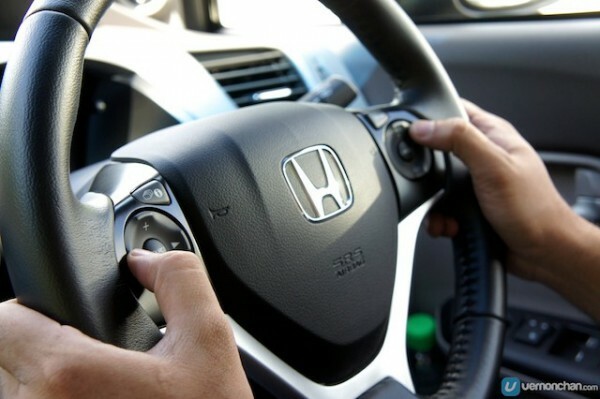 using them while at the wheel of an airbag equipped car can lead to broken arms, facial lacerations, and other injuries when that airbag instantly deploys at 200 mph. To avoid airbag injuries in a crash, the NHTSA recommends that you tilt the steering wheel away from your head, keep your hands at the 9 and 3 o’clock position and make sure that there is at least a 10 inch space between the airbag cover on the steering wheel and your breastbone.